I went to San Francisco last summer and Tartine bakery was one of the places I couldn't wait to visit. The tiny bakery/cafe was the perfect place to go to on a sunny morning and Oliver and I happily indulged in beautiful stone fruit bread pudding and large foamy cappuccinos. It was pure heaven. I spent quite some time eying the open bakery in the back and looking at the trays of delicious freshly baked goods as they made their way from the oven to the store. I wanted to try so many of the treats (the banana cream pies, the brownies, the lemon tarts, the perfectly buttery croissants..). When I got home, I knew I had to purchase the Tartine cookbook - San Francisco is unfortunately a little too far to go back to on a whim! After eying the book for inspiration for a while, I decided to start with this dough, and it surely didn't disappoint! This dough recipe has to be one of the best doughs I've made in a while: it's perfectly flaky, buttery yet not heavy and reminds you of the difference that 'homemade' makes. Making dough is one of those times where I really feel like traveling back in time: it's one of those rustic, back to earth activities that makes you marvel at how a pile of flour and a few cubes of butter can transform into such a beautiful end product. The dough does take a little bit of time to make though, but most good things do, right? Some cookbooks, especially those that divulge recipes from famous restaurants around the world can be a little disappointing. You try the recipes at home and it's really just not the same. This dough, however, really is bakery-quality and can be mastered at home with just a little practice. I filled these galettes with chocolate ganache and plums, but try it with pears, blueberries, strawberries, apple or rhubarb - it all works! To make the dough, cut the butter into 1-inch cubes and put them in the freezer. Measure the water, dissolve the salt into it and put into the freezer as well. Chill both for about 10 minutes. Measure the flour onto a large, flat work surface and spread into a rectangle about 1cm thick. Scatter the butter cubes over the flour and toss a little flour over the butter so that your rolling pin won’t stick, and begin rolling. When the butter starts flattening out into long, thin pieces, use a bench scraper to scoop up the sides of the rectangle so that it is the size that you started with. Repeat the rolling and scraping 3 or 4 times. Make a well in the center and pour all of the water into it. Using the bench scraper, scoop the sides of the dough into the center, cutting the water through the dough. Keep scraping and cutting until the dough is a shaggy mass and shaped into a rectangle. Lightly dust the top with flour and roll out the rectangle until it is half as large again, then scrape the top, bottom and sides together to the original size and re-roll. Repeat 3 or 4 times until you have a smooth and cohesive dough. Transfer rectangle of dough to a large baking sheet, cover with plastic wrap and chill for about an hour. When you are ready to roll the dough, divide it into 2 equal portions if making large galettes or 12 equal portions for small ones. Roll the dough into circle shapes by rolling from the center to each end, not flattening the end points. Turn the pastry so the flattened out corners are at the top and bottom. Again, roll from the center towards the points nearest and farthest to you, stopping short of the top and bottom. Roll the thicker areas and you will begin to see a circle forming. Transfer to baking sheets and chill for 10 minutes. Spread a layer a think layer of chocolate ganache on the bottom of each circle of dough, fill the center of each dough circle with fruit, leaving a 5cm edge uncovered on the large galettes or a 2cm edge on the small ones. Taste the fruit for sweetness and determine how much sugar you want to use to sweeten it. Sprinkle with brown sugar, typically using 2-4 tablespoons for large galettes and 1-2 teaspoons for small ones. Fold in the sides of the circle to cover the fruit partially. Chill for another 10 minutes. In the meantime, preheat the oven to 190ºC (375ºF). To make the egg wash, whisk the egg yolk and cream in a small bowl. Crush the egg wash over the pastry edges and then sprinkle with brown sugar. Bake the galettes until the crust has visibly puffed and baked to dark brown and the juice from the fruit is bubbling inside – 45-60 minutes for large galettes and 40-50 minutes for small galettes. Rotate the baking sheets at the midway point to ensure even baking. Remove from the oven and serve hot or at room temperature. Wow, that just looks and sounds sinful! That looks so amazing and I agree, homemade doughs, while time-consuming and labor-intensive at times, almost always yield satisfying results at the end! I love the look of free-formed pastries. I have seen your comment from my blog about restaurants in London. A lot of good restaurants in London. I occasionally go to Chinatown at Leiceister Square for Chinese cuisine. There are also some Japanese and Korean restaurants in that areas. If you like hot and spicy food, I would recommend Jom Makan in Westfield Shopping Centre in Shepherd Bush, which is a Malaysian restaurant, also in that area. I've been there last week, the foods were very nice. What a thing of beauty--I wish I could transport myself to SF and try out Tartine for myself! Прекрасна е!Поздрави и много усмивки! Wow. What wouldn't be good with a pound of butter? Your galette is gorgeous. i adore my tartine cookbook. i lvoe that it has no paper cover and can get messy with ease of wiping off. your galette is just perfect, as is everything you create. That galette looks dreamy & love your description of the stone fruit bread pudding and foamy cappuccino - yummy! Fantastic looking galette. And who can resist chocolate and fruit! chocolate and plum is an awesome combination! love it in this galette! nothing beats a homemade dough - it's the extra portion of love that makes it good! That looks incredible. For some reason I have never been inspired to make a galette but that lead photo of yours has changed my mind entirely. The dough looks delicious and every reason why we should be making homemade dough. Really can't wait to try this out. Thanks! Well worth the time, isn't it? I want almost everything when I go to Tartine. Your galette looks perfect - chocolate and plum, amazing combination. oh my! what a beautiful, rustic looking galette! I'm so glad you stopped by my blog, or I wouldn't have discovered yours! 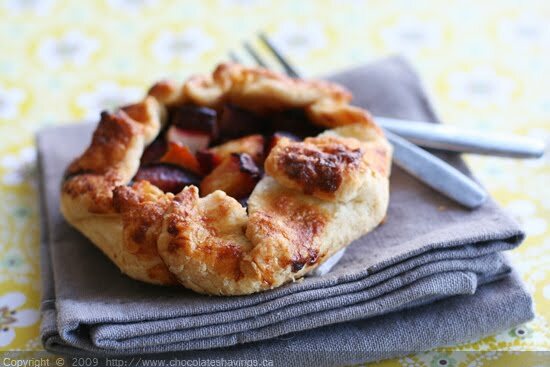 :) This is a lovely galette, perfect for spring/summer. Lovely! They are so simple and so satisfying. You did a amazing job of capturing their essence. Thank you! I love little, fruit galettes, and the crust on yours looks fantastic! That is one more book I need to add to my collection. and galette just looks amazing...where did you find plums this time of the year??? Tarts are so appealing - something about them just says 'Curl up with a book and a cup of coffee and eat me.' Or at least that's what they say to me... I haven't found a tart dough that hasn't fallen apart on me so I can't wait to try this one. Oh and Tartine the bakery IS the best, isn't it? You put so much love into this little rustic tart, I want to savor it!Chocolate will always win everybody over, but it was actually the plum that swooned me! Gorgeous!!! So beautiful and perfect! LOVE the chocolate and plum combo too. It's gorgeous! I'm sure it's worth all that effort! I love little bites like that and this galette looks perfect. You can already tell from the photo that the dough must be delicious! Lovely. I have never been to Tartine, but it sounds positively divine! Lovely Galette, great flavor combo. Believe it or not but I have never eaten a galette. Looking at yours just tells me it's something I must try one! I'm so in love with this galette, Jen - not only is it beautiful, but the idea of combining chocolate and plums are wonderful! Thank you for the heads up on the Tartine cookbook, the reviews are excellent and it's now on my wishlist. The galette is beautiful, looking forward to trying my hand at the dough, hoping mine will look just as beautiful.